It's pop quiz time again, dear readers. Can you, off the top of your head, name 10 AV receiver manufacturers? I have no doubt that the Denons and Yamahas and Sonys and Pioneers and Marantzes of the world rolled right off your tongue. You probably didn't have to reach far at all for Onkyo and Integra, and even high-end offerings like Cambridge and Anthem are almost certainly on your radar. But Arcam? Unless you own or have owned any of the company's gear, or you happen to live in Europe, I'd be willing to wager that this UK-based manufacturer of high-end audio electronics isn't at the forefront of your consciousness when shopping for new gear. And that's a shame, really--because if the AVR750 is any indication, the company's offerings should be on the short list of must-hear gear the next time you're itching for an audio upgrade. What makes the AVR750 so special? For one thing, it completely opts out of the features race by eschewing bundled apps like Spotify, Pandora, SiriusXM, etc. The receiver lacks integrated WiFi, Bluetooth capabilities, and of course Apple AirPlay, although it does have a wired network connection and there is a nifty companion app for iOS devices that allows you to stream music over your home network (from computers, NAS devices, and even mobile devices). 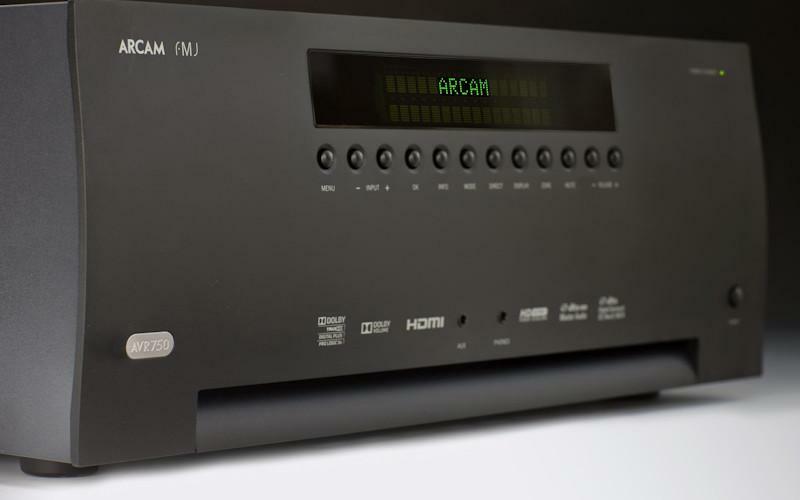 Instead of spending its money on licensing brand-name streaming features (or brand-name room calibration, or fancy industrial design, for that matter), Arcam instead invests in pure performance capabilities, and it shows. The receiver's amplifier topology is just one example of this: it operates in less-efficient but sonically purer Class A mode at lower listening levels, then switches to a more advanced Class G topology with multiple power supplies when more oomph is required. That's a pretty huge deal, and it contributes largely to the AVR750's appeal, as well as its pretty staggering price tag of $6,000. It's also one of the things that makes the AVR750's 100-watt-per-channel power rating difficult to compare with similarly specified AV receivers. Another is the fact that Arcam rates its power output honestly and conservatively, which few manufacturers in our industry do. The 100-wpc rating is measured with seven channels driven into an eight-ohm load at 0.2 percent THD. If you play the sort of numbers games that most AV receiver manufacturers play with power ratings, the AVR750 weighs in at an impressive 210 watts per channel, measured with two channels driven at one kHz into a four-ohm load. If you need a refresher on what those terms mean and how the relationship between amps and speakers works, you can check out our primer on the subject here. Despite the undeniable focus on high-fidelity audio performance, the AVR750 is a quite capable video hub, as well--with seven HDMI 1.4 inputs, all backed by excellent (if somewhat finicky) video processing that includes two types of noise reduction along with independent picture controls for each input, along with video upscaling up to 4K. The AVR750 also boasts basic multiroom capabilities, but only in the form of a single Zone 2 composite video output and a pair of RCA audio outputs. Only analog sources can be sent to Zone 2, and curiously enough the SAT and VCR inputs lack analog audio inputs entirely (yeah, you read that right: the only input for your VCR, if you still have one, is an HDMI connection). Little quirks like that pop up frequently when exploring the ins and outs and what-have-yous of the AVR750, but the receiver does make up for those quirks with a nice complement of audio/video connections and control ports. In addition to its aforementioned seven HDMI 1.4 ins and two outs (with audio return channel functionality), it sports three component video ins (although no component outs), six stereo analog RCA ins, four digital coax and two optical digital inputs, an Ethernet port for control and network connectivity, an RS-232 port, two IR control ports, and two 12-volt triggers, along with a 7.1-channel preamp output section and a USB port for music playback from compatible sources. Curiously, it lacks 7.1-channel analog inputs, which would have made a bit more sense than 7.1-channel pre outs--given that the receiver's unique Class A/Class G amplification is the biggest part of its appeal and price tag. As such, I can't imagine why you would want to bypass it. It's debatable, of course, as to whether or not that's an issue. A more objective criticism, I feel, would be its lack of balanced XLR inputs, which is strange given that all of the source components in Arcam's FMJ (Faithful Musical Joy) product line (of which the AVR750 is a part) do feature balanced XLR outs. Given that, the only inputs that I relied on during the course of my review were the Ethernet port and a handful of the HDMI ins. Sources mainly consisted of my Dish Joey whole-home DVR client, along with Arcam's own UDP411 universal disc player (review to come). My original intention was to spend considerable time with my own Oppo Blu-ray player connected to the AVR750 before subbing in Arcam's player, but the receiver had some issues with the Oppo at first, a topic I'll discuss in more detail in the Downside section below. I won't dwell too long on the control capabilities of the AVR750, since I know that's not a primary concern for Home Theater Review's typical readership, but it's worth nothing that Arcam does provide control modules for both Control4 and Crestron, as well as downloads of its IR and RS-232 code sets, on its website. The receiver can be controlled via RS-232 or IP, but not both. You have to turn on such capabilities in the setup menus, and at that time you have to choose between the two protocols. You'll have to use IP, of course, if you want to use Arcam's ArcamRemote app for the iPad, which doesn't work, unfortunately, for the iPhone. (The company's iPhone app is for control of UPnP streaming of local networked music only.) The included remote control for the system is pretty basic and not terribly well laid out, even though I do have to give it kudos for providing direct access to toggling features like room EQ and Dolby Volume without having to dig through the setup UI. In terms of hookup, I would be remiss if I didn't at least mention the excellent build quality of the AVR750 itself. It's a dense, robust, beautiful beast of a machine, perhaps a good bit plainer in appearance than other gear in its price class, but with exceptional fit and finish and lovely all-metal binding posts that made me almost lament the fact that all of my speaker cables are terminated in banana plugs and merely locked in place without the need for any twisting and tightening. At the other end of those cables sat the Aperion Audio Intimus 5B Harmony SD speaker system that I used for the duration of the review. The speakers were set up, balanced, and equalized using Arcam's own proprietary Auto Speaker Setup software, which is a modified version of the Cirrus Logic Intelligent Room Calibration that applies the bulk of its processing power to the bass frequencies, where room correction does the most good. What surprised me most about the Auto Speaker Setup system, especially during the hookup stage, was the fact that it absolutely nailed all of the level, distance, and crossover settings. I honestly didn't have to tweak a single parameter, which is exceedingly rare even with the best of such systems. That, combined with the fact that Auto Speaker Setup only measures the room from one position (your main listening position), made the installation process a snap.